Privatization campaign launched in Kyrgyzstan generated a nostalgic longing for the Soviet Union and revived ancient ways. "Back into the USSR!" a human rights activist muttered upon finally reaching her office on the other end of Bishkek, the capital of Kyrgyzstan. The problem is, she was wearing high heels and drivers of the so called marshrootkas (minivans performing the functions of cabs) were on strike that day. As it turned out, too much in the city depended on agile minivans whose drivers learned free enterprise laws all too well. The laws in question are fairly simple: establish a monopoly by squeezing municipal conveyances out first, dictate your own terms second. The former problem solved, minivan drivers began demanding higher transport fees. City fathers in their turn wouldn't be bulged, knowing as they are that even a som or two added to the transport fee might spark social protests. Going to their offices every morning, city-dwellers long for the Soviet past when buses and trolleybuses in Bishkek were abundant and fees were affordable. In fact, the Soviet Union is not only recalled in emergencies like the drivers' strike. A Kyrgyz newspaper ran a story a short while ago on who the Kyrgyzes would have preferred if asked to choose between their famous countrymen or people like Yakov Sverdlov and May 1 festivities... Author of the article called for renaming the streets bearing the names of revolutionaries of the early 20th century like Sverdlov after people like Chingiz Aitmatov (prominent Kyrgyz writer of the Soviet period) or Turdakun Usubaliyev and Absamat Masaliyev (erstwhile first secretaries of the Central Committee of the Kyrgyz Communist Party). In other words, the publication suggested changing Soviet names for the names of Soviet Kyrgyzes. Barely three days after the publication Bishkek legislature said the municipal authorities had suggested renaming Kievskaya Street into Absamat Masaliyev Street. Unfortunately or not, the idea collides with the acting legislation. This latter plainly states that at least five years since a person's death must pass before anything may be named after him or her. Masaliyev in the meantime passed away in 2004. Moreover, it is necessary as well to consider Ukraine's possible reaction (capitals of the two countries signed a friendship treaty). In fact, there is a loophole to be exploited by whoever has the determination and imagination. City fathers suggest making an exception for Masaliyev, renaming Kievskaya Street after him, and renaming Maxim Gorky Prospekt after the capital of Ukraine. That's probably what will happen. Moreover, there is already a monument to Masaliyev in the southern part of the country, where streets and squares bear his name despite the acting legislation. Like all other post-Soviet countries, Kyrgyzstan is making its own Pantheon. It seems that a place in it for Masaliyev has already been reserved. In June 2005, barely three months after the revolution, President Kurmanbek Bakiyev made Masaliyev Hero of the Kyrgyz Republic. Busy with post-revolutionary redistribution, the country did not care or respond. As a matter of fact, different strata of Kyrgyz society actually sympathize with Masaliyev. Nobody chooses to remember ethnic clashes in the Osh region that marked the decline of Masaliyev's political career. The last leader of the Kyrgyz Soviet Socialist Republic is remembered with fondness. All the same, the haste with which Bakiyev awarded Masaliyev left the impression that the attitude towards the late politician was not entirely ordinary. By and large, Bakiyev had statespersons of the past commemorated right upon his election the president. Busts of Masaliyev and other dignitaries of the past decorate Statehood Founders Alley in the central park of Bishkek. Masaliyev's birthday was celebrated in Kyrgyzstan with fanfare earlier this month. It was reported as well that Masaliyev's museum would be established soon, under the president's patronage. Is there anything connecting these two politicians? Sure thing. Both began their careers in the CPSU and Soviet state structures. Masaliyev became the first secretary of the Central Committee of the Kyrgyz Communist Party in 1985 and chairman of the Kyrgyz Supreme Council in 1990. In other post-Soviet republics, former first secretaries needed but a formal vote from the Supreme Council to become presidents, but Kyrgyzstan was a special case. A bona fide election took place where Masaliyev and Apas Jumagulov crossed swords in the second round. Neither polled the necessary number of votes though. Another election was organized eventually and Askar Akayev came in first to become the president. Masaliyev resigned as Supreme Council chairman at the following session of the legislature. Masaliyev stepped down and quit big-time politics quietly, without fuss and - even more importantly - without any intrigues against the new Kyrgyz leadership. (It was appreciated.) Neither did he become an enemy of Akayev or his policy even though his dislike of what he was seeing around was apparent. Masaliyev became Communist Party leader in 1992, hoping for changes in Russia which he believed would spark similar processes in Kyrgyzstan. It was Masaliyev who kept saying that Kyrgyzstan should join the Russian-Belarussian union. He even complained that he was unable to put the motion on the floor for the legislature to consider and pinned the blame for this inability on pro-Akayev majority. Masaliyev's interview with AKIpress news agency in 2003 was quite interesting. The Communist leader made the mistake of telling the journalist that there was a candidate for president he, Masaliyev, supported but wouldn't give any names. He said he did not want the authorities to know because "they may jail the man, or come up with something even nastier." Masaliyev's words hinted at existence of some plans for, as the later developments showed, Bakiyev. Reliable and trustworthy sources claim that a year later Masaliyev told some confidants from his native southern part of the country that the day had finally come to launch a campaign for presidency. Bakiyev was handpicked for the future president, Adaman Madumarov for his successor (the same Madumarov who would end up in the opposition, years after). Masaliyev's choice was logical and understandable. Past careers (one a former premier, the other an eternal lawmaker) and age of the candidates made them ideal for what decision-makers from southern Kyrgyzstan had in mind. Bakiyev and Madumarov were on top of these people's unofficial list of preferences. Bakiyev had resigned as prime minister two years previously, in the wake of the tragedy in Aksy where clashes between the police and peaceful demonstrators resulted in several deaths. Ex-premier had become a lawmaker and discovered that he had a lot in common with Masaliyev, a Communist deputy from his native south. Kyrgyz society has always listened to its elders. In this particular case, however, there was another factor at play. The prospects Masaliyev outlined for Bakiyev the lawmaker checked with his own desires. In brief, the once vague idea was acted on and had a whole team promoting it soon, a team comprising other politicians and Bakiyev's numerous relatives. It may be added here that it is highly unlikely that Masaliyev's plans stood for an actual overthrow that came to pass in 2005. A politician of the Soviet school used to caution, Masaliyev would have never even entertained the idea of a takeover by violence. His plans stood for consolidation of the southern elites and, probably, the use of traditional methods of political struggle: establish an organization, mobilize voters, put the regime under pressure, and hope to win the election. The Kyrgyz People's Movement was founded in the southern part of Kyrgyzstan in 2004. Bakiyev became its leader in November, after Masaliyev's death. No need to elaborate on what followed: conferences all over the country, Bakiyev's nomination as a candidate for president, and finally the revolution in Bishkek. Politician Felix Kulov released from imprisonment by his supporters had a talk with Bakiyev's followers those days. "You Northerners have had enough. It's out turn now," he was told. Kulov accepted the premise. His own popularity quite considerable, boosted by the speed with which he had put an end to looting in Bishkek in the first days of the revolution, Kulov nevertheless abandoned all thoughts of presidency for himself and agreed to become Bakiyev's prime minister. As a matter of fact, Kulov earnestly believed that representatives of the south could claim presidency for themselves now. Ever since the late 1950s, people from the southern and northern Kyrgyzstan in the Soviet Union had been taking turns at the reigns. One Izkhak Razzakov from the south was the first Kyrgyz leader of Soviet Kyrgyzstan (1950-1961). He was replaced with Usubaliyev from the north whose reign lasted 24 years making him a bona fide survivor in politics like Sharaf Rashidov in Uzbekistan and Heydar Aliyev in Azerbaijan. Masaliyev from the south replaced Usubaliyev and resigned in 1990. Akayev from the Kemin district in the north rose to the pinnacle of political power in 1990 and remained there until the very revolution in 2005. It was the turn of Bakiyev from the south then. Has Bakiyev accomplished what Masaliyev dreamed of? Has he established a truly people's regime in Kyrgyzstan. Free market reforms in Kyrgyzstan under way already, Bakiyev continued along the lines of the displaced Akayev. Some cunning scheming resulted in amendment of the Constitution and disbandment of the inconvenient parliament. The new legislature promptly removed all barriers interfering with grandiose privatization plans. Major energy enterprises, the very heart of the national economy, are expected to go under the hammer soon. It is not what Masaliyev wanted for Kyrgyzstan. Communist faction of the national parliament led by Masaliyev's son Izkhak challenges pro-Bakiyev Ak Jol faction on the issue of privatization. Nobody in Kyrgyzstan doubts that Masaliyev Jr. and Bakiyev are like-minded persons, but political issues regularly put them on different sides of the fence. The Communist Party constitutes moderate opposition to the regime in Kyrgyzstan. Genuine opposition to Bakiyev and his Cabinet comprises what political parties never made it to the parliament and the civilian sector. The latest kurultai or congress of the opposition adopted a demand to Bakiyev to prevent denationalization of energy producers and transfer of lands and four resorts on Issyk-Kul shores to Kazakhstan. The largest Kyrgyz non-governmental organizations formulated essentially analogous demands to the authorities. Enemies of the planned privatization claim that it will up living costs in the country and foment unrest. One of the gurus of Kyrgyz politics Ishenbai Abdurazakov told BPC journalists that "the nation is perplexed... general public is grossly disappointed with the course of the reforms." In the meantime, privatization in other post-Soviet countries (including Kyrgyzstan's neighbors for that matter) was carried out without much trouble. The population was left out of the process altogether or (as in Russia) ended up with vouchers not really worth the paper they were printed on. In any event, the fate of the Soviet economic legacy was decided by the elites. Discounting the Baltic states, Kyrgyzstan is the only post-Soviet country where battles for economic assets of the late USSR are still being fought and where the opposition and the civilian sector are involved in the process. 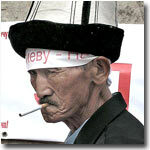 As for the Kyrgyzes, their traditions of nomadic democracy make them truly unique. The Kyrgyzes have never expected their rulers to settle matters of ownership for them but tackled these problems by themselves. When the Soviet Union disintegrated, the Kyrgyzes recalled the somewhat forgotten ancient ways and traditions. That is why the Elders Council of the Issyk Kul district met to discuss ratification by the national parliament of the border treaty with Kazakhstan that stood for transfer of the Karkyr area to the latter. A Committee for Karkyr was established... Since the treaty is ratified, there is nothing the locals can do about it of course, but their reaction shows that the issue is not settled at all. Sure, these protests are encouraged by the local elites who want the land in question for themselves but they act in accordance with ancient traditions in this case. Will the authorities manage to overcome these ways and traditions?